Omamori (御守 or お守り, omamori) are Japanese amulets (charms, talismans). They are commonly sold at shrines. Omamori are dedicated to particular Shinto deities as well as Buddhist figures. They are believed to protects a wearer from bad luck and brings good luck. They were riginally made from paper or wood. Modern amulets are small items usually kept inside a brocade bag and may contain a prayer or religious inscription. There are many types of Omamori. ↑ "お守りとは？(What is (a) charm)". お守りnavi. Retrieved 29 December 2014. ↑ Reader, Ian; Tanabe, George (2004). Practically Religious: Worldly Benefits and the Common Religion of Japan. University of Hawaii Press. p. 46. ISBN 0-8248-2090-8. 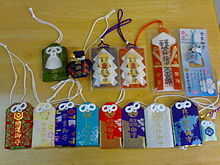 Wikimedia Commons has media related to Omamori. This page was last changed on 18 January 2017, at 04:54.